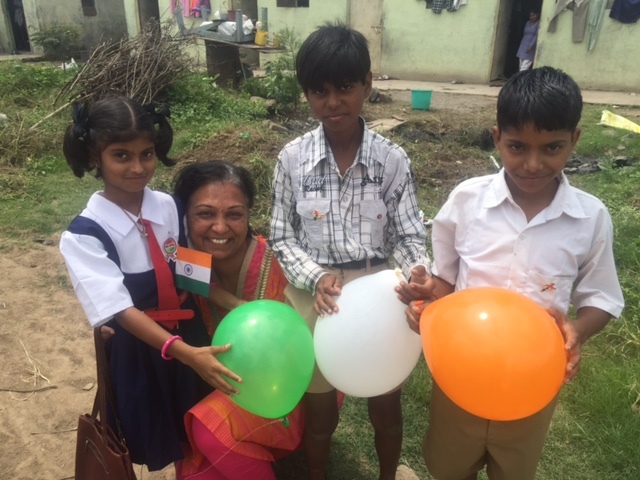 "This independence day, with a little nudge from a friend of mine, I stepped out early morning to celebrate this special day at a construction site with the children there. 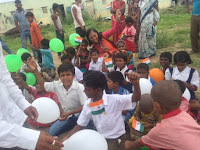 These children are beneficiaries of our "Every Child Counts" campaign that we run along with Door Step School. 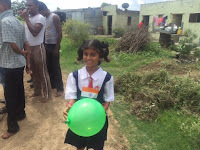 Close to 40 children were waiting for us with smiling faces when we reached the site. A quick round of introduction took place where we saw confidence and knowledge levels vary - some children exactly knew what they want to be when they grow up, what their favourite colour is, or where on the map of India their home town is located v/s some children being very shy and unaware what standard they do study in! 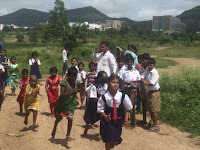 Well, all in all we realized they are the future of tomorrow and are all roaring with joy to face life! We started with one child narrating a powerful speech on Lokmanya Bal Gangadhar Tilak, some sang songs while others just stayed quiet and enjoyed being with us - the “didis” who work in the “anda” (egg-shaped) building campus! Yes that’s exactly how they know Infosys campus as! 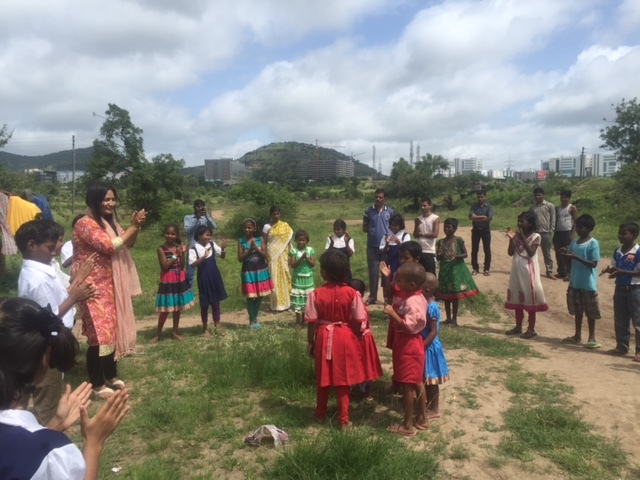 We then formed a circle and learned the song “When you are happy and you know it... Clap your hands” - what an apt song for the day, we indeed were very happy being with each other on this day. 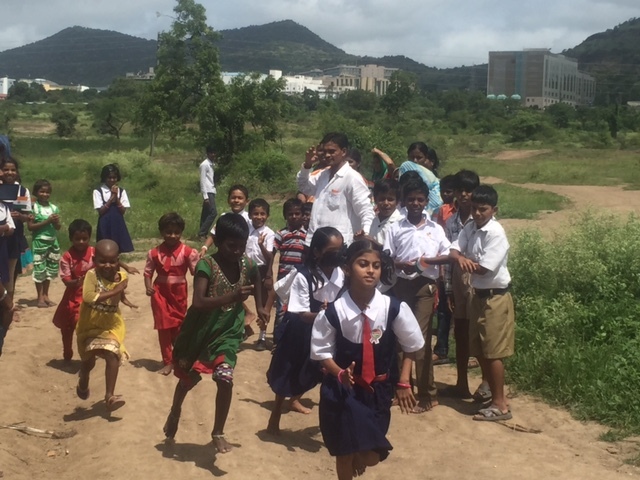 Some races were conducted for the children and also their parents got a chance to play some games amongst themselves. We then did a small discussion on what each color band on the tri-color flag meant, we sang the song “Hum honge kaamyab…”, we blew balloons of the 3 colors on the tri-color. Alas how much ever we tried to capture a posed picture with the balloons but with the energy levels so high we only managed some candid pics! 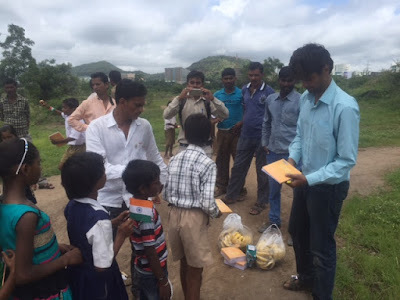 Finally it was gift time, a notebook and a pen were distributed to all the children there. Race winners were awarded, too. Snacks were distributed before we dispersed for the day. We hope with these interactive fun-filled 4 hours with the children, we managed to re-iterate the message amongst the children and their parents there that every "I" counts and together we can work for a better tomorrow - if each child goes to school, each parent pledges to send their child to school, each citizen ensures that every "I" counts today and every day - we all will have a better and happier tomorrow!"